2019 has certainly kicked off with a bang! From new product features, our growing and diversified team in addition to our incredible customer base…and now being honoured by CIO Magazine as one of the “Top 10 Construction Technology Solution Providers 2019”, it’s been one heck of start to the new year. If this is any indication of what 2019 has in store – bring it on! 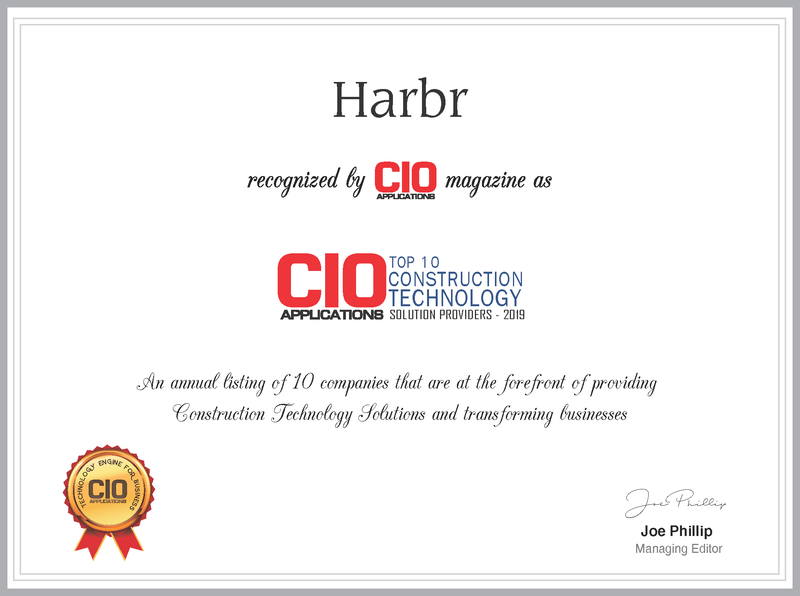 Fremont, CA – February 8, 2019 – CIO Applications has chosen Harbr as one of the Top 10 Construction Technology Solution Providers 2019. The positioning is based on an evaluation of Harbr’s in-depth capabilities in Retail Artificial Intelligence for the Construction Industry. The annual list of companies is selected by a panel of experts and members of CIO Applications’ editorial board to recognize and promote technology entrepreneurship. “Being amongst this prestigious group of construction innovators is tremendous recognition for the progress Harbr is making towards our mission of making it as simple as possible for retailers to build anywhere at scale while maintaining complete control of their brand”, says Harbr Co-Founder & Head of Product, Ashley Kielbratowski. “This honour is evidence of what we have been able to achieve this year – from new product features, to our growing diversified team to our expanded retail customer base, 2019 is looking incredibly promising for the team at Harbr”. “We are pleased to recognize Harbr for its ability to enable retailers to expand, innovate and grow so they can serve more customers by creating the best possible omni-channel experience,” said Joe Phillip, Managing Editor of CIO Applications. “Harbr is also the only Canadian company among the top 10 which is very impressive”. Harbr is a software-as-a-service work management AI for retail owners. With diversity ingrained in their DNA to foster creativity and innovation, their mission is to make it as simple as possible for retailers to build anywhere at scale while maintaining complete control of their brand. For more info: visit www.harbr.com, Facebook @goharbr, Twitter @goharbr, Instagram @harbrretailai or LinkedIn at Harbr.com. Read the full Harbr story at CIO Applications Magazine here.